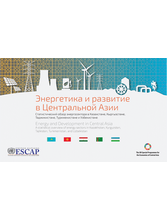 An overview of Central Asia's energy sector and its progress is depicted through data visualizations in this newly-released dual-language Russian and English booklet. More than 40 different regional and national data sets are displayed as charts and maps for Kazakhstan, Kyrgyzstan, Tajikistan, Turkmenistan, and Uzbekistan in the areas of energy supply and use, efficiency, renewables, environmental factors, economics, and trade. The overview draws on statistics and charts available through ESCAP’s Asia Pacific Energy Portal, asiapacificenergy.org.